Ahhh, swaddling – for many parents, it’s a miracle of a technique that helps babies sleep longer and better. All good things come to an end, and that includes swaddling your baby. But when should you stop swaddling, exactly? Some babies seem like they’re totally over the swaddle within a month or two of birth, while others seem to really like the swaddle for months and months. And, of course, as Baby Sleep Site® readers, we know you are no doubt working to build healthy sleep habits with your baby, so you may also be wondering when it’s best to stop swaddling, in order to avoid creating sleep associations. Lucky for you, this is exactly the question we are tackling in today’s topic! Keep reading for our top tips on when to stop swaddling your baby. Swaddled babies should NEVER sleep face-down. So if your baby is starting to roll over on to her tummy while she sleeps, that is a strong sign that it’s time to stop swaddling your baby. Remember, when it comes to swaddling, safety first! You can use a sleep sack instead, or a product like the ZipadeeZip that still provides a swaddle-like feel while leaving baby’s arms free (which is key when they start rolling over). If you are getting ready to sleep train, or sleep coach, you will likely want to stop swaddling first, before you begin sleep training. Part of the sleep training process involves helping your child learn to self-soothe, and babies need to be unswaddled and have access to their hands and fingers in order to learn to self-soothe. So there you go, parents! If your baby is older than about 5 months of age, is routinely breaking free of the swaddle, or is rolling over onto his/her tummy, it’s time to start weaning away from the swaddle blanket and to go with something like a sleep sack instead. And remember, if sleep training is in your future, you will probably want to wean your baby off the swaddle before you start the sleep training process. 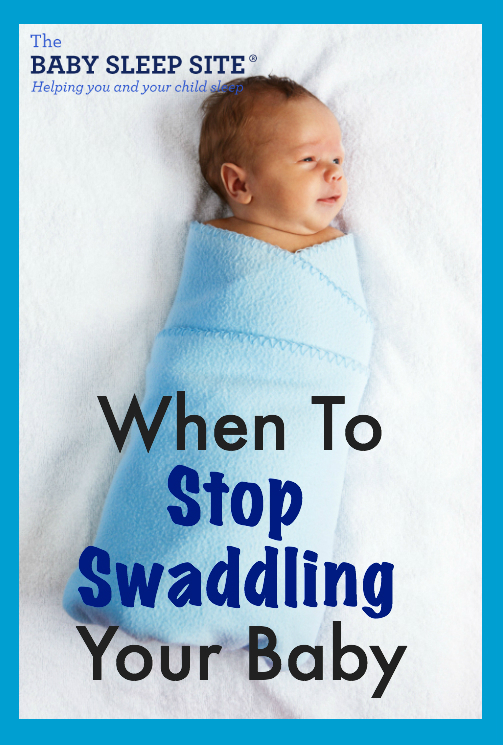 As for HOW to stop swaddling – we have tips on that, too! Check out this article, When and How To Stop Swaddling Your Baby, for step-by-step instructions on transitioning away from swaddling. Soothing and Swaddling and Sleep Training – Oh My! It can be tough to figure out your baby’s sleep…just when you think you’ve got it nailed, your baby changes, and boom! Whole new schedule, whole new set of needs, and whole new sleep problems. But remember, you don’t have to do this alone. We can help! Connect with one of our expert sleep consultants today, and she will craft a Personalized Sleep Plan™ just for you, that accounts for your baby’s sleep needs and personality, and your own parenting philosophies and goals. Have swaddling questions or tips? Leave them below – we love hearing from you! I use the Miracle Blanket for my baby and he has a been a really good sleeper (falling asleep on his own and only waking once a night for a feeding). But, the past few weeks, he has started waking twice a night and breaks free from his swaddle. Does this mean that it’s time to stop swaddling? Is he too young too sleep unswaddled, or should he be able to sleep okay without it at this point? Hi @Kristi, how old is your baby? Babies are never too young to stop swaddling (I always transitioned mine around 3 months although I didn’t have a particular reason for that – ha!) but some do have a startle reflex so they will wake themselves out through a quick startling movement without the swaddle. If you decide to stop, it will be a transitional period so give it some time for him to adjust. Hope that helps! He is 5 1/2 months old. So it sounds like he should be fine if we stop swaddling him? This is good to read. My baby sleeps really well through the night swaddled but has the strong reflex so is awake 10 minutes after going off to sleep, or not going off to sleep because she is slapping herself in the face… Going to continue swaddling for a while. Thanks for sharing a bit about your experience, Caitlin! I love and often recommend the Merlin Magic Sleep suit. Many parents stop swaddling a little too early because they haven’t been instructed properly or they feel it’s hurting their baby. There are also a plethora of self-sealing type outfits which are very helpful, especially if baby has a strong Moro reflex. @ Meredith Piscitelli – thanks for sharing this recommendation, Meredith – much appreciated!